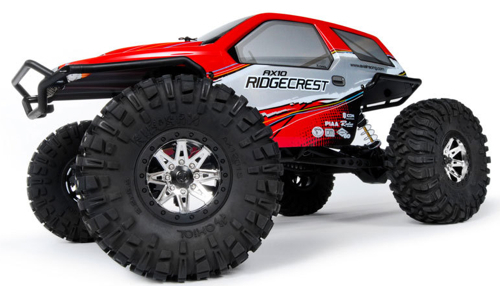 Axial RC Inc. is proud to announce that Trasharoo has been added to the sponsor list for AXIALFEST2014. You may remember Trasharoo being a part of our Rubicon Trek back in 2012 when we drove the SCX10™ Jeep® Wrangler Rubicon Unlimited RTR across the Rubicon Trail. Trasharoo supplied us with the full size version of their bag to help us keep the trails clean. Trasharoo will be donating both full size and scale versions for AXIALFEST2014! This is the 1/10th scale version of the full size Trasharoo made by the actual manufacturer Trasharoo. There isn’t a single one of us who is against the “Tread Lightly” philosophy, and many of us pack out our own trash, but how many of us pick up trash when we see it? Or, how often do we end up with some nasty burrito or sandwich wrapper in the vehicle and end up smelling it for the rest of the trip? Trash should be kept outside where we can’t smell it, it can’t drip on interior parts, and there should be more than enough room in a trash bag for what you bring and what ever you might find and want to pick up. The problem is, hanging a X-gallon Hefty bag off the back of your vehicle doesn’t work too well. one bump and its gone; and the old-style canvas bags that many of us are fond of flop around back there – damaging paint, and sometimes dropping more trash than they hold. With high-quality wide buckles, denier nylon. 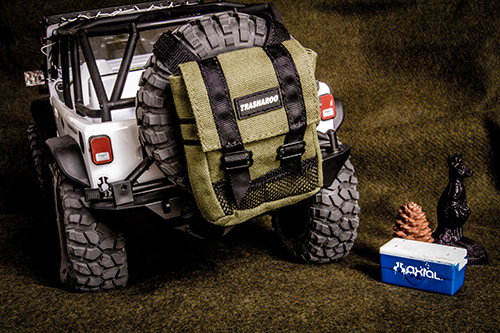 a heavy-duty attachment to your existing external spare tire, and positive-closing cover, you can haul away all the trash you accumulate in a weekend and maybe even make the trails a little cleaner as you go, without having to turn the inside of your rig into a disposal site. The TRASHAROO has been in testing for years, and with over 20 years of off-roading and overlanding experience Trasharoo knows what it takes to survive the rigors of off-road travel and what the off-roader needs. The owner was sick and tired of having his trash floating around in his rigs. and hated that the trash he picked up- which had been who knows where- would also occasionally be messing up his rig. As a Tread Lightly Trainer the owner of Trasharoo understands the responsibility we all must take while enjoying our outdoor recreation. Respect it or we may lose it. The product became a perfect fit. Trasharoo’s Mission is simple – Keep our trails open and land clean, Pack it in and pack it out, and make a quality product that will last for years or don’t make it at all. Axial RC Inc. is proud to announce that Speck has been added to the sponsor list for AXIALFEST2014. 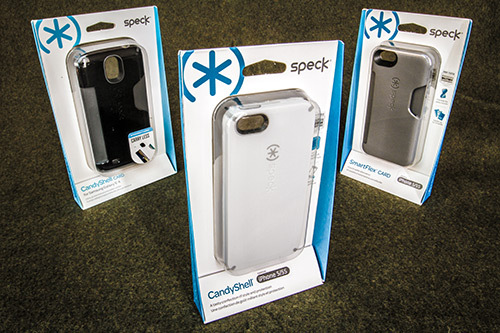 Speck is synonymous with high quality protection for all of your tech gadgets and phones when trekking on your latest adventure. Axial knows the importance of being able to share all of your great videos and pictures while in the desert, forest, mountain, or urban jungle. Protect your gear with Speck so you can upload your experiences without having to worry whether or not your gadgets will be as durable as your Axial rig! There are certain repairs or tasks that experienced hobbyists take for granted and newcomers to RC, in contrast, often find intimidating. A great example is replacing the primary gears, the pinion and spur. On Axial Racing vehicles, replacing these gears is extremely easy. Just follow these steps and you’ll be well on your way to mastering an essential RC skill. It may not be glamorous, but the first step is to get the area your going to be working clean. Axial’s rock crawlers are equipped with a gear cover that protects the gears and keeps them clean, but you don’t want to let that debris in when you start the dissasembly. Using either compressed air or brushes (tooth brush and stiff paintbrush), get the entire transmission clean. May special attention to the gear cover and the area around it. A rag with a mild cleaner may also be needed. The bottom line is the cleaner the better. While you can change the gears (especially the pinion) in an SCX10 or Ridgecrest without removing the transmission completely, dropping the transmission makes the process much easier. 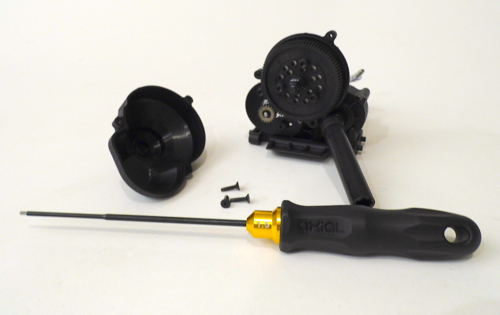 Removing the transmission from the SCX10 platform is easy. Using a 1.5 mm wrench, remove the set screws retaining the drive shafts to the transmission output shafts. Next, use a 2 mm wrench to remove the four screws on the bottom of the skid plate. You also have to unplug the two motor leads. The transmission and motor should now easily come right out. The Wraith is similar, but the entire skid plates needs to be dropped down. This requires only the extra step of removing the four screws on each side of the skid plate. 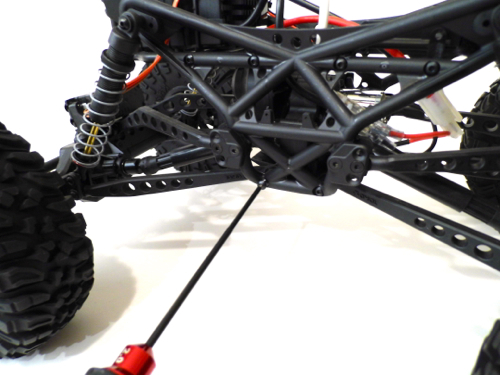 On either Axial Racing platform, the process of removing the transmission only takes a few minutes. The gear cover is retained by three small screws. 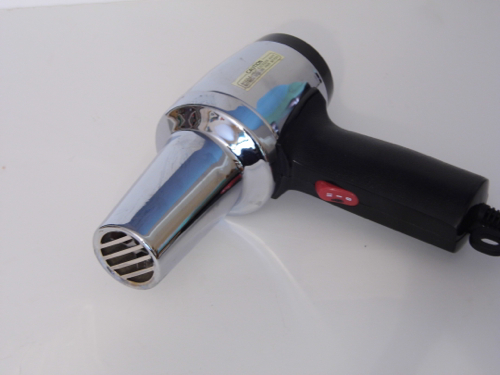 It is easy to remove using a 1.5 mm wrench. When the cover is off, wipe it out to make sure it is clean and place the three screws inside it so they don’t get lost. You will need the 1.5 mm wrench again to remove the pinion. Do not completely remove the small set screw. 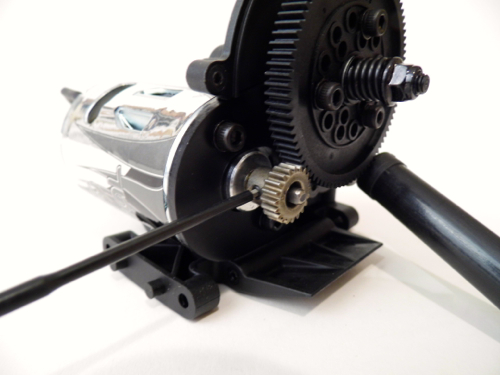 Just loosen the screw and slide the pinion off of the motor’s output shaft. If you’re replacing the pinion with the exact same size pinion, you do not technically have to loosen the two 2.5 mm motor mount screws, which adjust the motor position and gear mesh. If you wish to change the pinion size (tooth count), you will need to loosen (not remove), the two 2.5 mm motor mount screws. When installing a pinion there are two adjustments that need attention–pinion depth and gear mesh. Pinion depth is the position of the pinion of the motor shaft. The pinion must be position to have full, even engagement with the spur gear. 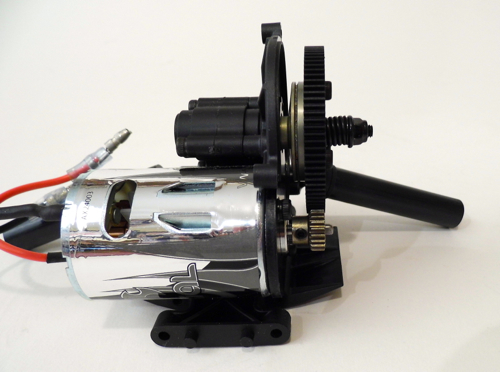 Simply adjust how far down the pinion is on the motor shaft so that it perfectly matched with the spur. Gear mesh is easy to do yet often done incorrectly. 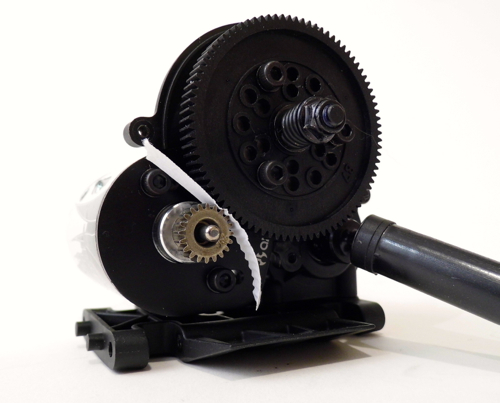 The tried and true method is to use a small piece of paper between the gears while tightening the motor up against the spur. The paper isn’t needed as the amount of free play or backlash between the gears can be set by a mix of feel and eye. The gears shouldn’t be too tight–fully engaged–or too loose–only the tips touching. Whatever method you use to set gear mesh, you need to check the mesh on more than one spot on the spur. Set the mesh and then rotate the spur a few times checking mesh as you go. When you’re done, double check that the motor and pinion screws are properly tightened. Do not over tighten the pinion’s set screw. The first step in removing the spur gear is to remove the 7 mm nut that holds the slipper adjustment spring in place. The 7 mm nut must be removed while the spur gear’s retaining screws are attached or the spur gear will just spin as you try to grip it to remove the 7 mm nut. With the 7 mm nut removed, slid off the spring and the two washers (the washers are slightly different sizes). 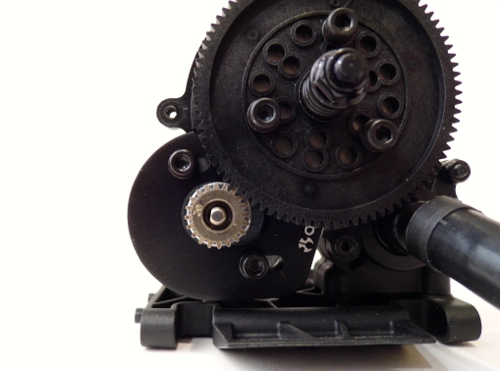 The spur gear is attached to the slipper mechanism via three 2.5 mm screws. 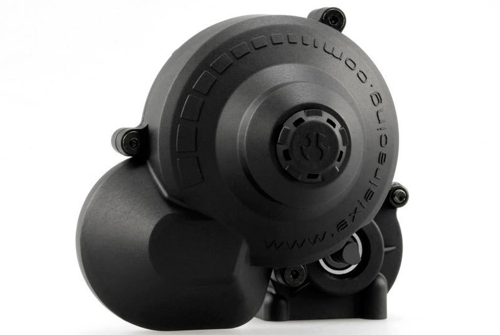 Removing the three screws and then the spur gear is easy–just don’t lose the small washers on each screw. With the three screws removed, the spur gear will slide off the motor’s input shaft. When installing a new spur gear make sure it is fully and evenly seated against the mounting plate. Tighten the three 2.5 mm bolts a little at a time. Next, install the larger of the two washers and then the spring over the input shaft. Next, install the smaller washer and tighten down the 7 mm nut. To reiterate, it’s large washer, spring, small washer and then retaining nut. Once all the parts are on the input shaft, tighten the nut until it bottoms out. Don’t force it. Just tighten the nut down slowly until it stops. Loosen the nut two full turns. 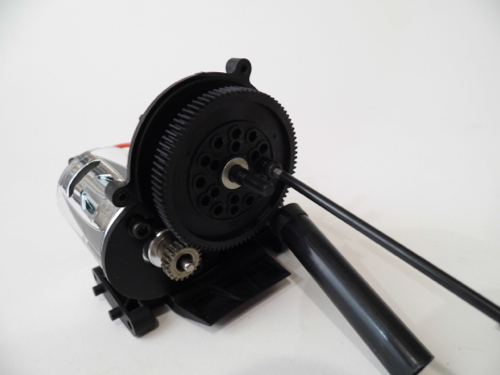 After the spur gear is installed, adjust the motor for proper gear mesh as described above. Don’t forget to check gear mesh at a few points while rotating the spur. The last step is to reinstall the gear cover and transmission if it was removed from the skid plate. Axial RC Inc. is proud to announce that Fast Eddy Bearings has been added to the sponsor list for AXIALFEST2014. 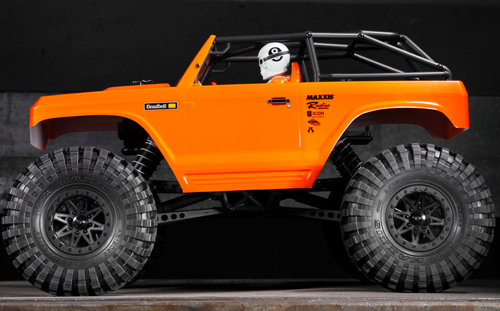 Axial RC Inc. is proud to announce that Vanquish Products has been added to the sponsor list for AXIALFEST2014. 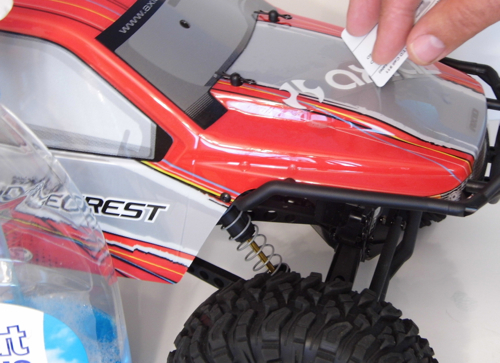 Vanquish Products, home the finest RC crawler and RC scaler parts and accessories. Vanquish products are all designed, manufactured, packaged, and shipped from all under one roof at their small factory in Sacramento California. 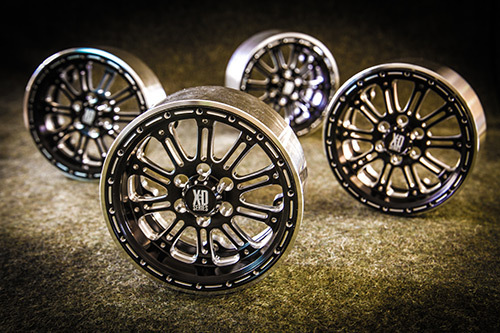 The Vanquish product line includes aftermarket parts for axial based crawlers and scale trucks that they have desire to make better and raise the performance bar. Who remembers what Vanquished donated to AXIALFEST2013? Reminder – they where green! 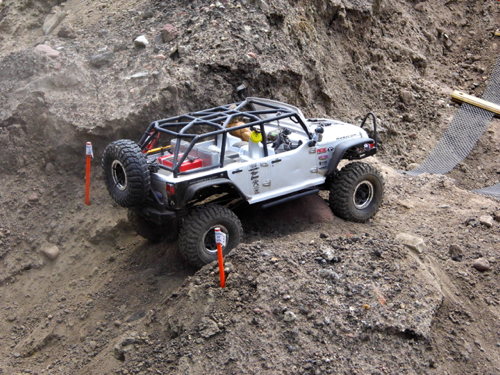 The Axial Wraith, Ridgecrest, SCX10 and XR10 all use linked suspension designs. This means the axles are attached to the chassis via links, be it a 3- or 4-link setup. 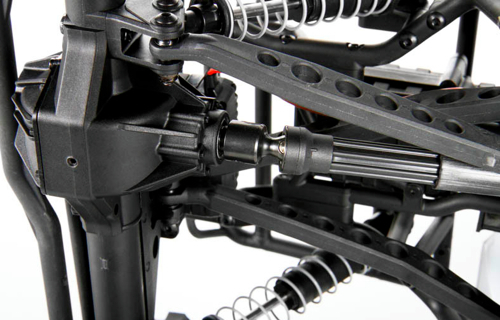 The links hold the axles in position and allow for an impressive amount of smooth terrain conquering articulation. Links also allow for a certain amount of setup tuning. If you have a full-size off-road vehicle such as a Jeep Wrangler, you are probably aware of pinion angle. For those unclear, pinion angle refers, not to the motor’s pinion gear, but to the angle of the input gear in the axle when viewed from the side. The combo of gears in a solid axle is called the ring and pinion, and if the pinion angle is too shallow, the drive shaft can bind. Pinion angle isn’t often referred to by an actual measurement or even measured. Sometimes full-size vehicles will be fitted with a tapered shim between the bottom of the leaf pack and the axle. This shim will be measured in degrees such as two or three degrees. Full-size vehicles such as the late-model Jeep Wrangler uses coil springs front and rear with links called control arms. Aftermarket companies offer adjustable control arms that allow the pinion angle to be adjusted. A longer upper link increases pinion angle (tilts it up). Adjusting the length of the upper links on the front axle also changes caster. Caster is the angle of the front axle’s hubs. Again, this is best viewed from the side. 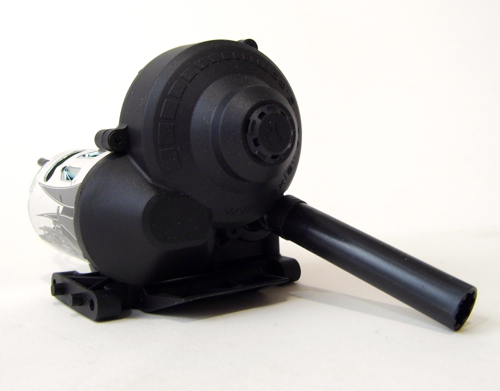 Take a look at the C-hub on the end of the axle. This is where the steering pivots. A vertical line can be drawn from the top pivot point on the C down through the bottom pivot point. The top pivot is further back than the lower pivot. This is positive caster. As you lengthen the upper link(s), the caster angle is decreased. 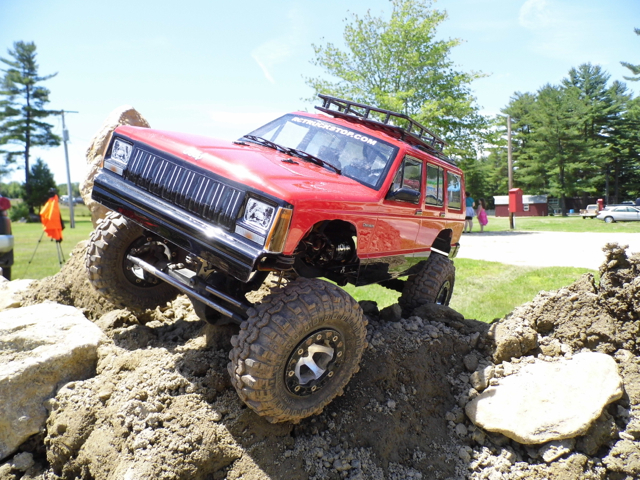 On a rock crawler, too little caster can cause poor steering as the inefficient steering geometry will cause the tire to somewhat push and fold over instead of grip and steer. The upper links help position the axle and the lower links do the same, but in reverse—longer lower links decrease pinion angle. The lower link length is really properly used to adjust wheelbase. After the desired wheelbase is achieved, pinion angle is adjusted with the correct upper link length. A longer wheelbase will help increase stability when climbing, which is very handy but less maneuverable—longer vehicles need more room to turn. Stretching the wheelbase a small amount is a good adjustment to experiment with, but you definitely don’t want an overly stretched wheelbase combined with negative caster. If you are often attempting a lot of difficult climbs, a longer wheelbase may be in order, but obviously there is a point of diminishing return. Remember to adjust the wheelbase you will need to lengthen both the lower and upper links. Adjust the upper links for proper pinion and caster angles. You can also change weight distribution by lengthening rear links more than the front. This will create more forward weight bias and increase climbing performance. We’ve all used stickers and have probably been doing so since we were kids. With so much practice why is it so hard to get good results when slapping stickers on an RC body? For some people, it’s easy, and yet for many others the end results—crooked logos, fingerprints and air bubbles—speak for themselves. Don’t let something like decals make your awesome rig look hack. Putting stickers on is easy if you follow these simple steps. As you probably know, your fingers are covered in natural oils. Thoroughly washing with warm soapy water right before you apply decals will help eliminate those oils (at least temporarily), and as a result, help prevent those fingerprints from getting under the clear parts of the stickers. Even with clean hand, you want to avoid touching decals as much as possible. 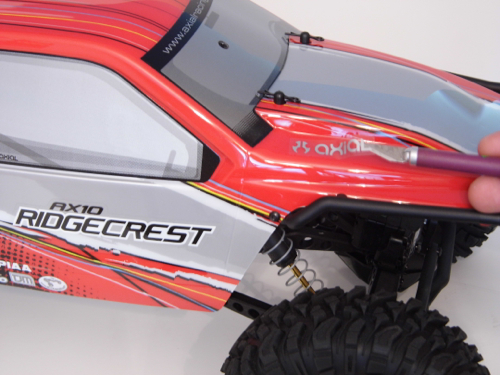 Axial Racing includes high quality decal sheets that are loaded with logos. To make your life easier, we have die-cut (sometimes called kiss cut) many of the decals. For the ones that aren’t precut, use a sharp hobby knife with a classic #11 blade. 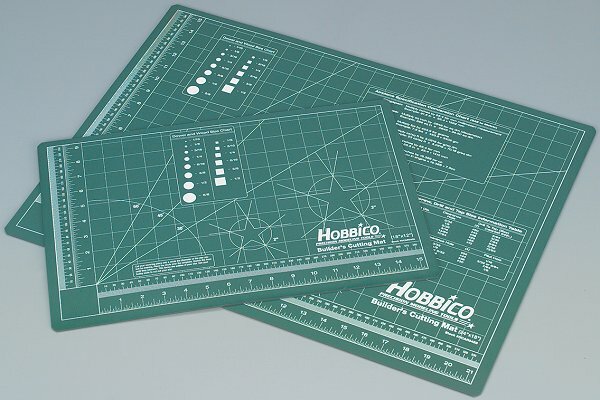 Hobbico has excellent knives, replacement blades and cutting mats. Using a knife will allow you to precisely cut out the desired logo and leaves the sheet intact instead of making a mangled mess out of it. Two tips to remember are to only cut deep enough to cut the vinyl decal material (you will lightly cut the backing and occasionally going through won’t hurt a thing other than your table if you aren’t using a cutting mat) and to cut as close to the logo as possible. The less clear you leave around the logo or image, the better the end results will look. Want to really look like a pro? After you have applied a pre-cut decal, lightly and very carefully cut the extra clear material from around the logo or image. The best tool for sticker placement is the same hobby knife you are now cutting them out with. Using the tip of the knife will prevent you from getting your fingerprints on the back and it will allow you to carefully and precisely place the sticker. Make sure enough of the knife tip is behind the decal so that it doesn’t flop down on the body and stick where you don’t want it. While some people have a hard time getting small stickers on straight, many more people completely blow it when applying big decals. One trick to try is to use a hairdryer or a heat gun (on low) to warm the decal material and make it more pliable. This will make the material floppy and a little clumsy to work with, but it will easily conform to the body. This trick is good for large decals that have to go around corners or curves or over uneven surfaces. Another trick is to use spray window cleaner to slide the decal into position and then carefully squeegee the fluid out. This allows you to perfectly position the decal. After you have all your decals placed, go back and carefully burnish (press) the vinyl. Pay close attention to all edges and stickers that go over ridges or indentations such as door panel lines. This will prevent dirt from getting under the decal. Once again that hobby knife will come in handy. 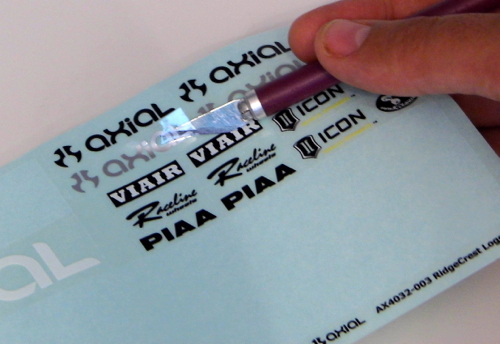 If you have an air bubble in a decal, you can gently make a small cut in it and then press it down. A long wrinkle may be impossible to completely fix, but cutting down the center of the wrinkle may allow you to press it down so that the goof isn’t so unsightly. At Axial Racing, we are full-size motor sports enthusiasts. It’s part of our culture, and this intimate connection with down-and-dirty real world recreational off-roading and professional racing allows us to develop and deliver the products we do. As such, we get involved with as many full-size events as we can. 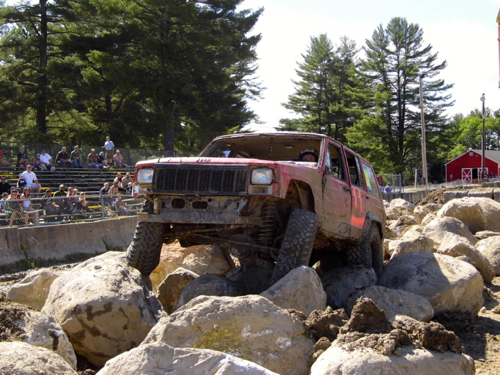 One such event we would like to bring to your attention was Rock Crawl Mania 2013, which was held in Swanzey, NH. The event consisted of a long U-shaped course that took competitors over dirt mounts, a sand pit, mud-soaked logs, large concrete blocks and finally across a long rock garden. Vehicles entered included tube-framed buggies down to street-legal Jeep Wranglers. The timed course proved to be extremely challenging with many competitors unable to finish. 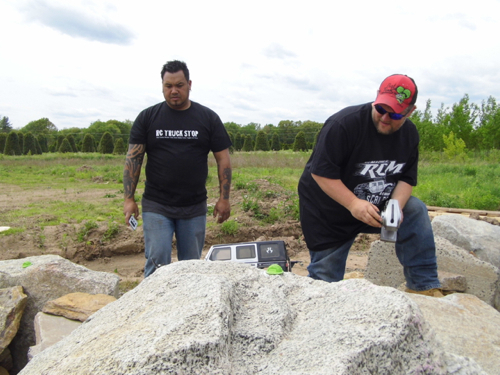 In addition to the full-size competition, Rock Crawl Mania 2013 included an RC demo that helped expose the hobby to hundreds of potential new enthusiasts. You can read full coverage at RC Truck Stop. RC Madness (RCM) in Enfield, CT is one of New England’s oldest and largest hobby shops dedicated to RC. A move in recent years to a larger property has allowed significant expansion. 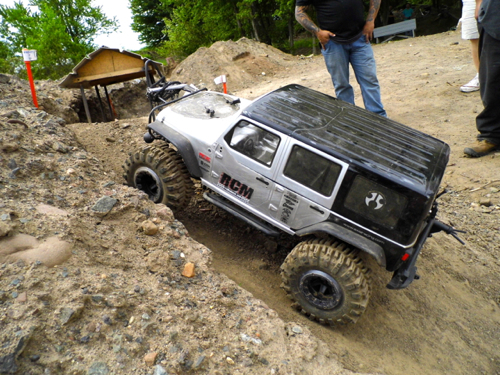 In addition to numerous indoor and outdoor tracks, RC Madness has a large outdoor rock crawling area and hosts weekly competitions. The Spring Fling trophy competition kicked off the start of the outdoor crawling season (they also have indoor scale and competitive crawling courses to help you beat cabin fever). The Spring Fling event included three courses for scale truck two classes–Class 2 and Class 3. 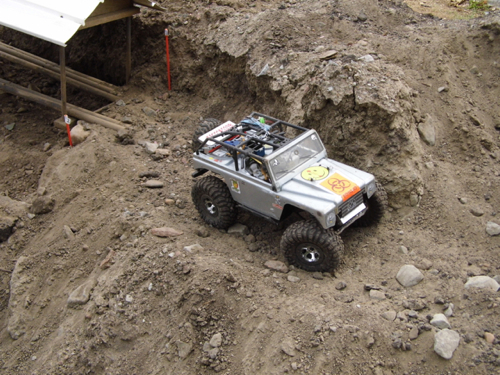 Whether you run an XR10 in 2.2 competition or an SCX10 scaler, RC Madness has terrain for you. This competition was for scalers only, but 2.2 comps are also held at RC Madness.